Steiner begins this book by quoting Faust: 'Blood is a very special fluid. ', and then goes on to explore the significance of blood in occult rituals. It's quite a short book and is comprised of only the one chapter. 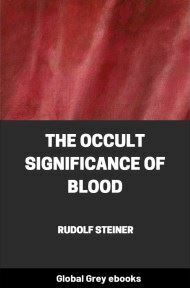 If you want to know more about why blood is so important in the occult, this makes an interesting read.